The story of Mal Coven the family man, the businessman, and the entrepreneur for whom retirement from the Biway has meant pursuing original entrepreneurial ideas -- as well as brushing up against and corresponding with celebrities Barbara Walters, Larry King, Nancy Sinatra, Jackie Mason, Bud Selig, Mort Zuckerman, Arthur Sulzberger Jr., and others.Coven reveals the secrets behind his and Abe Fishs founding and development of the Biway, a hugely successful discount chain that predated the coming of Wal-Mart to Canada. 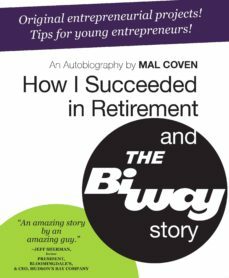 During their twenty-eight-year tenure, the Biway grew to 249 stores across eight provinces, delivering quality merchandise at low markups and low prices never before seen in a chain store in the country. Interwoven throughout are stories of the authors many passions, including breakfasts with "The Knights of the Round Bagel," following the Toronto Blue Jays, and cultivating his taste for smoked meat, hot dogs, and other fun foods.